Choosing between McCain and Obama means choosing who will make your health care decisions. Here’s a guide for the patient and consumer. In 1994, Harry and Louise portrayed a couple concerned about the changes that the sweeping health reform proposals offered by then-President Clinton would mean for their health care and health insurance. The Harry-and-Louise advertisements have become legendary because they captured the central truth that what matters most in health reform is how the changes will affect middle-class American families. In this election year, we have analyzed the health reform plans that Sens. Barack Obama and John McCain are offering in their presidential campaigns. We assess the amount of control and choice American families would have over their health coverage and costs under each plan, because we believe this is the central issue that will determine acceptance of a new plan by the American people. There are clear and distinct differences between the health reform plans offered in this election year by Sens. John McCain and Barack Obama, but the Republican and Democratic presidential candidates’ proposals nonetheless share some important features. The two candidates agree, for example, on the importance of quality improvements, better use of prevention and chronic disease management, and enhanced use of information technologies in the health sector. They both emphasize the need for better coordinated care and use of comparative effectiveness studies to guide treatment, and they advocate paying health providers based on health outcomes instead of simply for services rendered. The candidates agree that electronic medical records are essential to enhance quality, efficiency, and patient safety and to facilitate coordination of care by the primary care doctors, specialists, nurses, and pharmacists involved in treating a patient. Sens. Obama and McCain also agree that health care and health insurance cost too much. But how to bring down these costs is where they diverge. Sen. Obama sees a much bigger role for the federal government, while Sen. McCain believes a truly competitive market for health insurance is the best way to lower costs and increase choices. Polls consistently show that Americans want the freedom to make their own choices and that they value private health insurance. While both candidates say that is what they offer, the Galen Institute1 assessed the two major presidential candidates’ plans to determine how their policies and rhetoric align. Sen. Obama promises bureaucrats will stay out of people’s health care decisions, but the details of his plan do not back up this promise. “The most popular FEHB plan, Blue Cross Blue Shield Standard Option, offers comprehensive medical services with modest cost sharing (including a $600 deductible and $15 copayments for doctor visits). In 2008, the full monthly premium charged by that plan was $1,027.95 for family coverage. The federal government contributed $713.48, and the enrollee paid the remainder. In addition, this new national plan would quickly undercut private plans. Not only would private plans be forced to match the expensive benefits of the government plan, but they would not have the same authority that the government would have to impose and enforce price controls and draw on government policing and taxing authority. The new government plan would therefore be able to underprice the private plans, which must include all of their costs in the premiums they charge. • Federal regulation of insurance plans. Sen. Obama writes in the September/October edition of Contingencies Magazine that the new regulations he would impose on private plans would provide “watchdog” action “to help reform private insurance.”8 The Exchange would create new rules and standards for health plans, requiring that the private and government plans offer the same generous benefits, strictly limiting consumers’ ability to find and select plans that may better fit their needs and pocketbooks. Insurers would be faced with new requirements to justify their premiums, administrative costs, and medical payouts to regulators. • Coverage mandates. All health plans, public and private, would be required to issue policies to every applicant (“guaranteed issue”) and charge similar premiums regardless of health status (“community rating”). In many states where these insurance regulations have been implemented, the cost of policies has soared.9 These rules have the impact of drying up private competition and likely giving consumers no alternative to the new government program – a crushing blow for consumer choice and patient freedom. We conclude that the National Health Insurance Exchange would also curtail rather than enhance consumer choice. Employer “play-or-pay.” Sen. Obama would require employers to pay an as-yet unspecified amount for their workers’ health insurance or pay a new tax to fund the government health plan. If they are not “playing” in the new system by funding their employees’ insurance, they will be “paying” one way or the other. It would be an understatement to say some new government oversight and auditing would be required to ensure employer compliance. Smaller businesses may be exempt from the mandate and would be provided tax credits to help purchase coverage for their workers. But the help would come with many strings attached. Whether through incentives or penalties, the federal government would dictate the scope of the health coverage that must be offered, no longer leaving decisions to businesses and workers. By locking health insurance to the workplace, Sen. Obama would deny workers the option of making their health insurance arrangements through other groups or plans, restricting rather than enhancing consumer choice, and likely causing a loss of jobs. Mandate for children. The federal government would require that all children must have health coverage. The government therefore would need to define an acceptable policy that parents would be required to purchase, and government officials then would have to determine the fines and penalties that would be imposed on parents who don’t comply with the mandate. Reinsurance for employers. Sen. Obama would create a new program in which the federal government would take over a portion of the high-cost health expenses for workers. While the provision at first seems to lift a burden off businesses, it would in fact place many new requirements on them. Employers would need to document that every penny they spent on health care so the government could determine whether it was an approved medical service. This is a back door to federal determination of benefits and imposition of price controls in the health sector, and it would create a paperwork nightmare for companies. For example, the government wouldn’t allow one company to pay $600 for an MRI and another to pay $1,000, because the second company would reach the trigger point for government backing sooner. The government therefore would have to set out a schedule for payments for all medical expenses to make sure all companies reached the reinsurance threshold at the same pace. Employers would see little or no savings since, under the Obama plan, they would be required to return any savings they receive from this program into workers’ health premiums. Patients who passed the catastrophic trigger (which is not specified in the Obama literature) would likely be thrown into a program with government determination of allowed benefits and services. Instead of working with their previous health plans, patients most likely would be dealing with the new federal program that would oversee their coverage and access to care. Further, this new plan would provide a perverse incentive for employers: They would have less reason to help manage care and cost, and more reason to get sicker patients off their rolls and into the new federal program. Expand government programs. In addition to these new programs and bureaucratic requirements, Sen. Obama would expand existing government programs, including Medicaid and the State Children’s Health Insurance Program (SCHIP). This would put millions more Americans on taxpayer-funded health care programs that rely on government-determined access to benefits and price controls that have the effect of restricting access to private physicians. Claims of cost savings. Sen. Obama says the average family would save up to $2,500 a year as a result of disease management, better use of information technologies, and reduced administrative costs. But analysts question whether the savings would materialize and doubt the money would actually accrue to individuals. The New York Times reported in July that “the health policy advisers who formulated the [$2,500 savings] figure say it actually represents the average family’s share of savings not only in premiums paid by individuals, but also in premiums paid by employers and in tax-supported health programs like Medicare and Medicaid.14 ‘What we’re trying to do,’ said one of the advisers, David M. Cutler, in explaining the gap between Mr. Obama’s words and his intent, ‘is to find a way to talk to people in a way they understand.’” Therefore, Sen. Obama’s own advisors acknowledge that any savings would not actually accrue to individual consumers but would be to the system as a whole. Conclusion. Under the promise of fairness and choice, Sen. Obama’s approach to health care lays the groundwork for government-defined health benefits and a hefty dose of new federal bureaucracies and regulations. As a result, we believe that patients and health care consumers would face new costs and a dwindling number of options under his plan. Sen. John McCain’s health care direction differs from Sen. Obama’s over the key question addressed in this paper: Who would control decisions over coverage? While Sen. Obama would create new bureaucracies that encourage people to use government-defined coverage, Sen. McCain’s policies emphasize a greater range of choices in a more competitive marketplace for health care and health insurance. He says the solution is not to exert even more government control over our health sector, arguing that would only add to the “inefficiency, irrationality, and uncontrolled costs” of today’s system. Rather, he says “The key to reform is to restore control over our health-care system to the patients themselves.”19 Both candidates agree health costs are the number one problem, but Sen. McCain’s answer is to rely on the forces of competition and consumer choice rather than more government regulation and bureaucracy. Access to health insurance. Sen. McCain would replace the current tax break that locks health insurance to the workplace with a new refundable tax credit of $5,000 for families and $2,500 for individuals to help them buy health insurance. This credit would give families more control over their health benefits, would provide new help for the uninsured, and would modernize health insurance so it is portable and people don’t have to lose their coverage when they lose or change jobs. The McCain plan has been criticized for taxing workers’ health benefits. This is inaccurate. Sen. McCain replaces an outmoded tax break with a new direct, refundable credit. And the new $5,000 credit would be worth more to the great majority of Americans than the current invisible and regressive tax break, worth $4,200 today a year for a high-income family.20 Those with lower incomes would see greater benefits, and those on the lowest end – who pay no income taxes – would still get the same credit. Rather than a tax increase, the McCain tax credit would in fact lead to a tax cut for the great majority of workers. In fact, health coverage is part of the employee’s overall compensation package, but the value of these non-tax wages is generally invisible to workers, many of whom think the insurance is a gift from employers. Under the McCain plan, that part of workers’ income they receive in the form of health benefits would be visible, as would the new direct tax benefit. Take as an example an employee with a taxable income of $66,000 a year and who receives a family health insurance policy at work worth $10,000. The $10,000 in compensation is currently invisible to the employee because it is a non-taxed benefit. If this person is in the 25% tax bracket, he currently receives a tax benefit worth about $2,500, assuming no other deductions, that protects the $10,000 policy from being taxed. But under the McCain plan, this worker would see his wages increase to $76,000 and would receive a $5,000 tax credit toward health insurance. He would still be able to get the $10,000 policy but would be $2,500 ahead in tax savings. Substituting the tax credit for the current exclusion of health benefits from taxation would be merely a bookkeeping change for workers, but most Americans would see fatter paychecks in the process. Sen. McCain’s health plan also has been criticized for threatening the stability of employment-based health insurance. Critics say it would undermine the employment-based system because the employer would lose his tax deduction. But this is inaccurate. Whether the employer offers compensation in the form of health benefits or direct compensation, employers still would receive a tax deduction for the amount they spend on health coverage. In addition, the payroll taxes they pay would continue to be protected from corporate income taxes under the McCain plan. These provisions make providing health insurance neutral for employers in terms of financial incentives. Help for the uninsured. And for the first time, people would get the same credit whether they get their health insurance on their own, through new groups that would form, or at work, as the great majority of people would continue to do. The credit would provide new help and fairness to the uninsured, as well as to part-time workers and small business employees who get little or no share of the $250 billion21 that currently goes to subsidize employment-based health insurance. And because the credit is refundable, even those who pay little or no taxes would receive the full amount of the credit toward their purchase of health insurance. The average price of health coverage that people buy on their own is less than half the cost of a job-based policy, so the credit could provide significant help in enabling them buy coverage for their families. A survey by Forrester Research found that families purchasing health insurance in the individual market pay between $3,300 and $4,550 a year for health insurance.22 Many of these are high-deductible plans, but for most of these families, the $5,000 credit would pay for the full cost of the policy and even provide extra money to fund the deductible. While offering a different approach, we believe these provisions would enhance consumer choice and give people more options not only in where they get health insurance but also in their ability to make their own decisions about the benefits covered in the cost of the policy. Portable policies. The great majority of people who have job-based insurance today would most likely keep their current coverage because their incentives would not change. But people shut out of the job-based insurance system or who prefer to buy health insurance on their own would for the first time have an equal tax subsidy for doing so. In addition, in a reformed marketplace, people would find other groups, such as professional and trade associations and churches, through which to purchase health insurance to receive group discounts. Those who opted to choose their own plan, rather than having their employer choose it for them, could keep that plan when they changed jobs or moved. Portability leads to greater security in health coverage since people would have control over their coverage. Further, patients wouldn’t be forced to change from one doctor or one network to another when their employer changes insurers or when they change jobs. This would lead to better continuity of coverage and care and greater individual choice over health insurance and providers. A competitive marketplace would force companies to provide adequate benefits, because in a larger market individual consumers, rather than government bureaucrats or legislators, would be deciding what benefits and policy structures they want. Insurance companies would have to cater to the desires of millions of people, instead of employers buying coverage for them in bulk. Guaranteed Access Plan. While 18 million people buy health insurance in the individual market today, many still are concerned about whether they would be able to find an affordable policy under the McCain plan. Critics have raised concerns that giving people more freedom to purchase health insurance outside the workplace would mean they would be denied coverage, especially if they have pre-existing conditions or otherwise have trouble getting insurance. To address this need, Sen. McCain would create several new programs to help these patients. He would work with each state to establish a non-profit Guaranteed Access Plan, governed by a board of citizens, legislators, business, and medical community leaders. The board would contract with insurers to provide policies, and federal assistance would be provided as long as the states assure that people have a choice of different plans with affordable premiums. People up to 400% of poverty would get additional federal assistance, above their refundable credit, so they could afford the coverage. Medical Liability Reform. Sen. McCain has said frivolous medical lawsuits are a “source of needless cost and trouble in the health care system.”28 While allowing patients legal recourse when malpractice occurs, reform would ease health costs and hold doctors to clinical guidelines and patient safety protocols. According to Medical News Today, Dr. James Bean, president of the American Association of Neurological Surgeons, told a September health symposium that reducing frivolous lawsuits would be a key to lowering health care costs.29 But that’s not the only problem, Dr. Bean explained: Legal reform is important just to keep doctors working. We address the deficiencies of these studies in two issues of Health Policy Matters.33 The Buchmueller article does not give the detailed assumptions on which the authors relied. But one thing is certain: They don’t account for market dynamics that we believe would give people new options in a more functional market and increase access to more affordable health coverage. “The improved efficiency that should result from the McCain credit, combined with a powerful incentive to purchase health insurance and a beneficial effect for low-income people, would seem to make this policy particularly attractive to both sides of the political spectrum,” according to the Tax Foundation’s Carroll. Overall, the National Taxpayers Union Foundation estimates Sen. McCain’s health care proposals would cost $9.6 billion per year, in contrast to their estimate for Sen. Obama’s at $139 billion per year. Before the next president makes any wholesale changes to the U.S. health system, it is imperative that he – and we, the consumers – understand how his proposals would work. That requires cutting through the campaign rhetoric and paying attention to the actual policies. But changes to the private health insurance market are needed to bring those without coverage into the system. Sen. Obama would seek to have the government insure far more people, creating new ways to bring them under the federal umbrella. Sen. McCain would give people a refundable tax credit toward purchasing insurance, and they would be much freer to find the arrangement that works best for them and their families. We conclude that Sen. Obama’s plan would shrink consumer options. In contrast, McCain would open up access and competition, creating more options for consumers. There are many costs that can’t yet be counted and it is a long way from the campaign trail to real reform. Congress has the authority to craft, pass, or block health reform. But the vision that the successful presidential candidate will bring to the White House will greatly impact the direction of reform – and the choices that will be available to the American people in the future. Research Director Tara Persico contributed to this report. 1Galen, the second-century Greek physician for whom the institute is named, was a prolific writer, philosopher and a medical genius far ahead of his time. He advanced knowledge on both the theoretical and practical levels, which is what the Galen Institute seeks to do for today’s market-based health reforms. 2“Background Questions and Answers on Health Care Plan,” BarackObama.com, at http://www.barackobama.com/pdf/Obama08_HealthcareFAQ.pdf. 3Joseph Antos, Gail Wilensky, and Hanns Kuttner, “The Obama Plan: More Regulation, Unsustainable Spending,” Health Affairs Web Exclusive, September 16, 2008, at http://content.healthaffairs.org/cgi/content/full/hlthaff.27.6.w462/DC1. 4Robert E. Moffit, Ph.D., “Government as ‘Competitor’: The Latest Prescription for Government Control of Health Care,” The Heritage Foundation, August 14, 2008, at http://www.heritage.org/research/HealthCare/wm2024.cfm. 5Brett J. Skinner, Mark Rovere, and Marisha Warrington, “The Hidden Costs of Single Payer Health Insurance: A Comparison of the United States and Canada,” Fraser Institute, September 30, 2008, at http://www.fraserinstitute.org/researchandpublications/publications/6215.aspx. 6Grace-Marie Turner, “How Good Is Our Health Care System?,” San Diego Union-Tribune, June 30, 2008, at http://www.galen.org/component,8/action,show_content/id,13/blog_id,1058/type,33/. 7“Federal Employees Health Benefits Program: Guide to Federal Benefits Programs for New Federal Employees,” U.S. Office of Personnel Management, at http://www.opm.gov/insure/health/new_employees.asp#fehb. 8Senator Barack Obama, “Promising All Americans Good Value and Good Health,” Contingencies, September/October 2008, at http://www.contingencies.org/septoct08/obama.pdf. 9“Guaranteed Issue,” Issues and Answers No. 100, Council for Affordable Health Insurance, October 2007, at http://www.cahi.org/cahi_contents/resources/pdf/SCN100GuaranteeIssue.pdf. 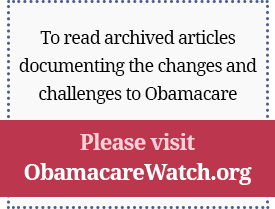 10Michael D. Tanner, “A Ford in the Road: Obama, McCain, and Health Care,” Briefing Paper No. 104, Cato Institute, July 29, 2008, at http://www.cato.org/pub_display.php?pub_id=9561. 11Ellen Meara, Meredith Rosenthal, and Anna Sinaiko, “Comparing the Effects of Health Insurance Reform Proposals: Employer Mandates, Medicaid Expansions, and Tax Credits,” Employment Policies Institute, February 2007, at http://www.epionline.org/study_detail.cfm?sid=104. 12Congress has already struggled with the question of health insurance for children, seeking to cover more under the State Children’s Health Insurance Program (SCHIP). However, two-thirds of uninsured children already are eligible for either SCHIP or Medicaid and are not enrolled. Still, the focus has become raising the income limit for families to enter SCHIP, which would cause some families to drop the private insurance they have for their children and rely on the government program. 13Joseph Antos, Gail Wilensky, and Hanns Kuttner, “The Obama Plan: More Regulation, Unsustainable Spending,” Health Affairs Web Exclusive, September 16, 2008, at http://content.healthaffairs.org/cgi/content/full/hlthaff.27.6.w462/DC1. 14Kevin Sack, “Health Plan From Obama Spurs Debate,” The New York Times, July 23, 2008, at http://www.nytimes.com/2008/07/23/us/23health.html?_r=2&oref=slogin&oref=slogin. 15Roger Feldman, Ph.D., Lisa Tomai, M.S., and Sally Duran, M.S.H.A., “Impact of Barack Obama 2008 Health Reform Proposal,” HSI Network, LLC, August 21, 2008, at http://www.hsinetwork.com/Obama_HSI-Assess_08-21-2008.pdf. 16Joseph R. Antos, Ph.D., “Symptomatic Relief, but No Cure — The Obama Health Care Reform,” The New England Journal of Medicine, September 24, 2008, at http://content.nejm.org/cgi/content/full/NEJMp0806561. 17“Democratic Presidential Candidate Spending Analysis — Barack Obama,” National Taxpayers Union Foundation, September 25, 2008, at http://www.ntu.org/pdf/P080925_ObamaAgendaCostUpdate.pdf. 18Senator John McCain, “Better Care at Lower Cost for Every American,” Contingencies, September/October 2008, at http://www.contingencies.org/septoct08/mccain.pdf. 19Remarks by Senator John McCain on Health Care on Day Two of the “Call to Action Tour,” April 29, 2008, at http://www.johnmccain.com/Informing/News/Speeches/2c3cfa3a-748e-4121-84db-28995cf367da.htm. 20“The Facts about the McCain-Palin Health Care Plan,” JohnMcCain.com, at http://www.johnmccain.com/content/default.aspx?guid=9b94f39b-1650-4a3a-89ef-fba8cba4c868. 21C. Eugene Steuerle, “Prescribing Better Under Bush’s Health Plan, “Urban Institute, January 29, 2007, at http://www.urban.org/publications/1001051.html and Jonathan Gruber, “Tax Treatment of Health Benefits,” testimony before the Senate Finance Committee, July 31, 2008, at http://finance.senate.gov/hearings/testimony/2008test/073108jgtest.pdf. 22“The Cost and Benefits of Individual Health Insurance,” Forrester Research, September 2007, at http://www.ehealthinsurance.com/content/expertcenterNew/CostBenefitsReportSeptember2007.pdf. 23Remarks by Senator John McCain on Health Care on Day Two of the “Call to Action Tour,” April 29, 2008, at http://www.johnmccain.com/Informing/News/Speeches/2c3cfa3a-748e-4121-84db-28995cf367da.htm. 24“Guaranteed Issue,” Issues and Answers No. 100, Council for Affordable Health Insurance, October 2007, at http://www.cahi.org/cahi_contents/resources/pdf/SCN100GuaranteeIssue.pdf. 25Stephen T. Parente, Ph.D., Roger Feldman, Ph.D., Jean Abraham, Ph.D., and Yi Xu, B.A., “Consumer Response to a National Marketplace for Individual Insurance,” University of Minnesota, June 28, 2008, at http://www.hsinetwork.com/National_Marketplace_7-21-2008%20FINAL_Blind.pdf. 26Merrill Matthews, “McCain Is Right on Interstate Health Insurance,” The Wall Street Journal, October 1, 2008, at http://online.wsj.com/article/SB122282743245193057.html. 27Remarks by Senator John McCain on Health Care on Day Two of the “Call to Action Tour,” April 29, 2008, at http://www.johnmccain.com/Informing/News/Speeches/2c3cfa3a-748e-4121-84db-28995cf367da.htm. 29“America’s Health Care at Risk: Guaranteeing Patient Access to Specialty Care,” Medical News Today, September 19, 2008, at http://www.medicalnewstoday.com/articles/122030.php. 30Robert Carroll, “McCain’s Health Credit: The Intersection of Health Policy and Tax Policy,” Fiscal Fact No. 144, The Tax Foundation, September 16, 2008, at http://www.taxfoundation.org/publications/show/23610.html. 31Thomas Buchmueller, Sherry A. Glied, Anne Royalty, and Katherine Swartz, “Cost and Coverage Implications of the McCain Plan to Restructure Health Insurance,” Health Affairs Web Exclusive, September 16, 2008, at http://content.healthaffairs.org/cgi/content/abstract/hlthaff.27.6.w472. 32Sara R. Collilns, Ph.D., Jennifer L. Nicholson, Sheila D. Rustgi, and Karen Davis, Ph.D., “The 2008 Presidential Candidates’ Health Reform Proposals: Choices for America,” The Commonwealth Fund, October 2, 2008, at http://www.commonwealthfund.org/publications/publications_show.htm?doc_id=707948. 33Grace-Marie Turner, “Health Credits and Drug Importation,” Health Policy Matters Newsletter, Galen Institute, September 19, 2008, at http://www.galen.org/component,8/action,show_content/id,14/blog_id,1084/category_id,0/type,33/ and Grace-Marie Turner,” Reality vs. Rhetoric,” Health Policy Matters Newsletter, Galen Institute, September 26, 2008, at http://www.galen.org/component,8/action,show_content/id,14/blog_id,1090/category_id,0/type,33/. 34“Republican Presidential Candidate Spending Analysis – John McCain,” National Taxpayers Union Foundation, September 25, 2008, at http://www.ntu.org/pdf/P080925_McCainAgendaCostUpdate.pdf. 35Gary Burtless, ” Comments on New Income and Health Insurance Coverage Statistics,” The Brookings Institution, August 26, 2008, at http://www.brookings.edu/~/media/Files/events/2008/0826_poverty/0826_poverty_burtless.pdf. 36Robert J. Samuelson, “Health-Care Realism,” The Washington Post, September 10, 2008, at http://www.washingtonpost.com/wp-dyn/content/article/2008/09/09/AR2008090902520.html.